Joe Kline was born in Washington, D.C. in 1949, and has lived in California since 1961. 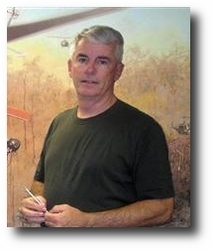 His artistic specialty for the past 35 years has been painting military aircraft in a technically and historically correct context. 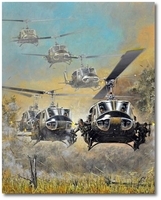 His paintings exhibit a highly realistic style and have been done for such notable aviators as General Jimmy Doolittle, Presidents George H.W. and George W. Bush, and are included in the private collections of thousands of former military aviators, air crewmen and veterans from WWII to the present War on Terror. 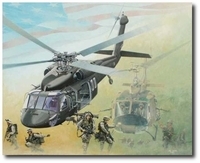 ​ His works have also illustrated many books, magazines and other publications, and are in the collections of the U.S. Air Force Museum, U.S. Army Aviation Museum, the Legion of Valor Museum, and many other galleries and museums featuring military aircraft. He traces his interest in aviation to his father, who was a B-25 bombardier with the 340th Bomb Group in the Mediterranean Theater during WWII, and his own experiences as a Huey helicopter crew chief with the U.S. Army’s 101st Airborne Division during the Vietnam War. Following his military service, he worked as a mechanical engineer for McCormick & Co. for 27 years, and has been the Public Information Officer for the City of Gilroy, California since 2000. He has a B.S. Degree in Industrial Design. 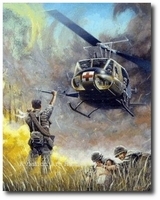 He is an Artist Member of the American Society of Aviation Artists, the Vietnam Helicopter Crew Members Association, the 101st Airborne Division Association, Heli-Vets, The Vietnam Helicopter Flight Crew Network, and is the founder of the Kingsmen Reunion Association. He is also an Associate member of the 57th Bomb Wing Association, and is an honorary member of the 173rd Airborne Brigade Association and the 7/17 Cavalry Association. He and his wife Donna have three daughters and two grandsons, and live in Gilroy, California.